MANILA, Philippines (RELEASED) – The 'March 2018 LET results' or the Licensure Exam for Teachers (Elementary and Secondary levels) list of passers, top 10 examinees, top performing schools, performance of schools and related announcements are available at this website as PRC officially released the results online 40 working days after the board examinations. 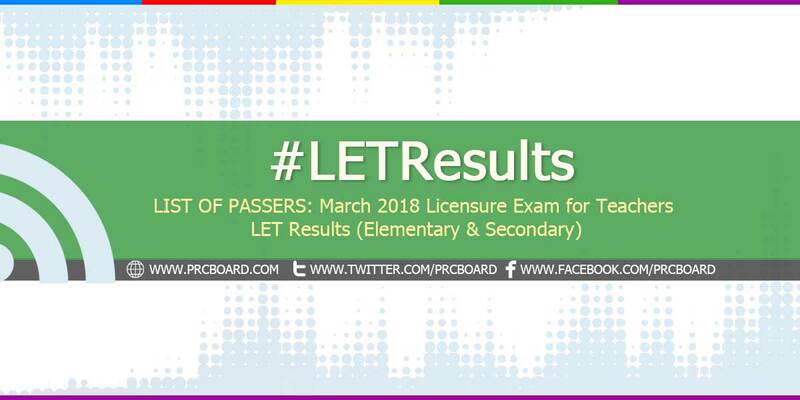 As announced, 13,774 elementary teachers out of 58,323 examinees (23.62%) and 22,936 secondary teachers out of 76,673 examinees (29.91%) successfully passed the March 2018 LET. PRC further said that out of 13,774 elementary level passers, 4,360 are first timers and 9,414 are repeaters while for secondary level, 15,035 passers are first timers and 7,901 are repeaters. According to the Commission’s Resolution No. 2017-1068 series of 2017 entitled “Schedule of Licensure Examination for Year 2018”, the target release date of March 2018 LET result will be on May 22, 2018 (Tuesday) or thirty seven (37) working days after the board exams. Update: Results are expected very soon... Stand by here for LET Passers 2018. Hi. Result is 23. Delayed kasi original target is 22. The number of working days is computed with respect to four (5) declared holidays in March, April and May 2018 particularly the Maundy Thursday on March 29, 2018, Good Friday on March 30, 2018, "Araw ng Kagitingan" on April 9, 2018, Labor Day on May 1, 2018 and Barangay and SK Elections on May 14, 2018. However, PRC may also release the LET official results earlier or later than the stipulated date without prior notice. Just keep tuning-in at this article for timely updates. On the most recent LET conducted September 2017, results were released after forty three (43) working days. On March 2017, results were out after forty (40) working days. During September 2016 and September 2015 LET, results were out after forty eight (48) working days while forty one (41) working days on March 2016. The schedule of registration for issuance of Professional ID and Certificate of Registration will be from June 4 to June 11, 2018 for Elementary Level and June 14 to June 29, 2018 for Secondary Level. The March 2018 LET for elementary and secondary levels covered the following GenEd and ProfEd topics. Licensure Exams for Teachers (LET) - Elementary and Secondary levels are scheduled twice a year to cater the growing number of professional educators. Below is the next schedule of exams. On the most recent LET conducted September 2017, 21,198 elementary teachers out of 80,509 examinees (26.33%) and 49,626 secondary teachers out of 107,020 examinees (46.37%) successfully passed the exams. University of Santo Tomas (UST) was the top performing school in elementary level having 113 out of 106 examinees passed or an overall passing rate of 93.81%. University of the Philippines Los Baños (UPLB) ranked first in the secondary level having 98.33% or 59 out of 60 examinees passed. Complete performance of schools for September 2017 LET are posted here. To receive up-to-date news about March 2018 LET Teachers board exam results, we advise our visitors to bookmark this page, visit PRC official website or follow us at our social media pages via Facebook and Twitter. Good luck everyone! You can make it. Trust in the Lord! what time po release nung mga passers? Hoping and Looking forward to see positive result..In God there's no impossible..Amen! In GOD'S name inaangkin ko po na isa ang kapatid ko sa makakapasa..GODBLESS ALL..
SAAN BA MAKITA ANG RESULT? "daw"? Sino nagsabi? Hindi ba bukas pa? Lord please give me an another chance to prove myself that i am truly worthy . ngayon poba release ng result? yes. amen. sure ba ngayon ang labas ng result? Claim it guys! In Jesus Name! IN JESUS NAME.. AMEN ������HOPING AND PRAYING ������ MAGIGING LPT AKO!!! Ngayon ba lalabas ang result o bukas pa? What Time ba talaga??? God is in control. We just need to trust His timing. All things will work out for our good. Let's entrust everything to God. I claim victory satin teachers. Makakapasa yung milabs ko diyan. Hahaha. oo nga ang tagal naman. Ang tagal naman ng result. Na traffic ata. wag dumaan sa EDSA kasi. In God's grace.. I proclaim I will pass..
Lord Jesus dingin mo mga Panalangin ko. Salamat po. Lord i know I pass this let thnks gd LORD. plz help me o GOD to pass the let,thnk u Lord. San po makita ang result? Kelan ba? MAY YOUR NAME BE GLORIFIED IN JESUS NAME AMEN! I ENRUST EVERYTHING TO YOU OH LORD... YOU'VE SHOWN ME ALL THE SIGNS I ASKED. MAY YOUR NAME BE GLORIFIED, IN JESUS NAME, AMEN! I PASSED THE BOARD MAY THE HOLY SPIRIT BE WITH ME. Hindi ako susuko LORD. Alam ko na may mas MAGANDA kang PLANO PARA SA AKIN at NANINIWALA ako sa'yo. Sana makapasa husband ko, para sa parating naming baby para double blessing! -Amen. Lord sana makapasa ang ate ko . .
Its 2pm already. And i'm very nervous and excited sa result, what time kaya lalabas result? To God be the Glory! papasa tayo! Woooh nakakakaba!.LPT na this! Lord i already surrender myself to you. because i trust in you. i belive in the name of JESUS!! Please oh Lord, we sorry for our sins, and please forgive us and let our prayers and dreams come true. In Jesus name, Amen. I CLAIM IT... PASADO N ANG KUYA ADENG KO... IN JESUS NAME.. .. PRAISE GOD! I CLAIM IT ! WE WILL PASSED THE EXAM! PRAISE GOD! I CLAIM IT! I CLAIM IT! AMA TINULUNGAN NIYO PO AKO,MARAMING SALAMAT SAYO! Bat ang tagal ng result aba ba ngayon ba talaga lalabas. MATAGAL PA PO BA? HUHU DI NA AKO MAKAHINGA. GOD SANA MAKALUSOT ALANG ALANG LANG SA ANAK KO AT PAMILYA KO HUHUHUHU. wat time mag labas ang result ? Mailalabas na kaya ang result today, nalate ata nang sobra? Mga anong oras kaya lalabas yung result? Lord sana po pumasa silang lahat na nanalangin sayo. Sila po ang pangalawang magulang ng aming anak na gagabay at huhubog sa pagkatao ng mga kabataan. Maraming po sa inyo panginoon. Parang bukas pa po lalabas..
LORD GOD I seek for my ate's success.. Thy will be done. Kayo na po ang bahala, alam ko ginawa nya po yung best nya for this exam. Mama Mary, pls pray for us. Wen will be the release of the LET Result? Lord, sana makapasa po ako. Makapasa po kami. huhuhu. Lord, Sana ipasa niyo po kaming lahat..
yes lord..make me feel happy lord to a chieve passing let exam..AMEN! Kailan b lalabas ang result? ?sana pumasa mga pinsan at pamangkin ko. Sana mka pasa ang wife ko Ya Allah. Hoping na sana mapabilang yong pangalan ko sa listahan ng mga papasa. Good morning huys, sure na daw po today ang labas ng result :D goodluck satin! hnd pa today ang result..madelay din yan..
i hope everything will be alright according to the results. GOD is still observing. ang tagal naman irelease ... cant wait. what if di ka nakapag test last march 2018 pwede pa bang gamitin ung noa mo ohh mag reregister ka ulit? bat wala pa ang result? congrats to all new teachers. welcome to proffesional world. Totoo po ba yung 4 na examinees hindi pa ma releasa? Ano po ba ang rason hindi pinost yung namesn nila? kelan maging available ang online verifation of ratings? what if nawala po yung NOA, ano po pwedeng gawin para makita ang rating?